Angela Peters said the nail salon felt it would be too difficult to do her nails because her hands shake due to cerebral palsy. A Walmart employee stepped in during her break. See video. 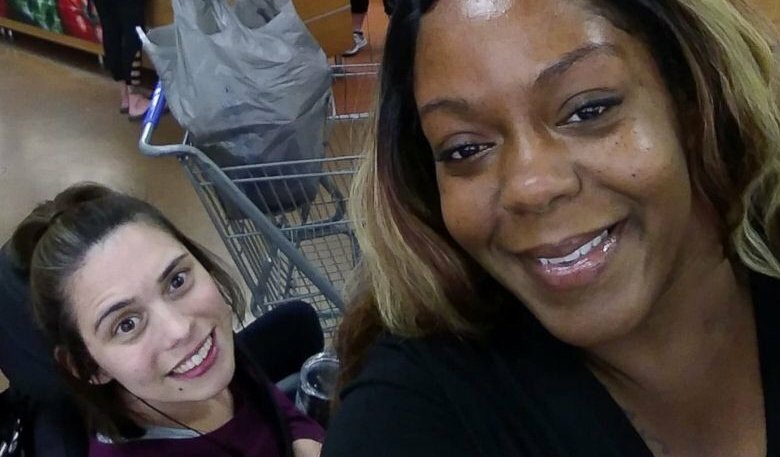 (BURTON, Mich.) — After one of her regular customers, a woman with a disability that sometimes causes her hands to shake, was refused service at a nearby nail salon, Walmart cashier Ebony Harris decided to help. Foregoing her break, Harris, 40, offered to paint Angela Peters’ nails for her. The pair picked out a shade of sparkly blue that Peters liked and sat down at the Subway seating area inside the Walmart in Burton, Michigan. Peters said she felt happy when Harris was doing her nails and the two were talking. Peters, 36, has cerebral palsy, which can make her hands shake. She said the nail salon felt it would be too difficult to do her nails. Harris said after she found out, she wanted to create a special day for Angela. Peters apologized for her shaking hands as Harris painted her nails the shade of glittery blue, but Harris told her not to apologize. In fact, Harris said she was a little unsteady herself. “I was a little nervous and was shaking because I didn’t want to mess her nails up,” Harris told ABC News. A woman who works in the Subway restaurant, Tasia Smith, saw the nail painting session. She said the act of kindness brought her to tears. She snapped a photo of Harris and Peters, posted it on her Facebook and it went viral. Harris said she appreciates all the attention the story has been receiving. Both women said their main goal was to raise awareness for people with disabilities, not to punish or boycott the nail salon. “We want people to look at the positive side of the story, that there are a lot of good people out here,” Harris said. Harris, Peters and Smith intend to continue their new friendship and go out to dinner sometime soon.